Great topic from other boards.......This week I got a few extra cans of goods at the store, getting set up for reloading rifle cartridges, and finally got the OK from the wife for the genny! just gotta get some money together now! Expanded our garden area and planted turnip greens. Read all the forums possible. Our survival mode right now is to make it through the Dave Ramsey course so seeked out all the survival ways that would help our finances. Example: FTA TV. We also began our chicken coop for the new chickens we're getting next weekend. (using gleaned scrap lumber from construction dumpsters and the dumpster at work. Today I took the wife out to shoot the Bushmaster for the first time, she also shot a few boxes of .40 and a half a round of sporting clays. Spent the late afternoon cooking some gumbo to put up for the winter. I ran two miles and worked on my upper body. And now Im ready for bed! I've been working on a mosin magant carbine, makeing it into a scout rifle. I worked on the stock today. Went out an shot my new shot gun and got in some practice with the Glock 19 as well. I filled up a few more food grade buckets with beans, first by placing them in mylar bag linings, and gasing them with CO2 . Sealed the bags, put the lids on the buckets and sealed them with some silicone, labeled and dated them. Also bought some more canned food for the pantry. Need to inventory some of my firearms related preps this evening. so far today, I showed up for work in order to make a little money for current bills and just in case cash. Not really a HUGE step in the SHTF direction, but more of a defensive action of holding on to what I have. I've been doing more research into silver, and have been making stragetic investments as I am able to. Also looked into buying a shotgun. Learned how to make natural cordage, made fire with bow drill. Listened to a bunch of Jacks podcasts that I had been kinda avoiding (Don't know why) still got 30 to listen to lol. I received my latest seed order, most of which will get grown in containers over the winter. All have a 75% germination rate so as long as I do my part should have plenty of fresh food for year round. Though I got a lot of peas, most of those will get planted in my garden, after being treated with an inoculate, to act as a winter ground cover. It surprised me when she wanted to go last year, I really enjoy shooting with her. However, great words of wisdom, never, never, never, put two 2 3/4 8's then a 3" OO buck......well you know where this is going. She is still cussing me for that. This is for what I did yesterday. I took my Hi-Point 995 and zero-ed the sights. Its alot easier to zero the sights than to zero the damn laser sight. I also spoke at length with both my step-father and my mother about the current economic situation and what has been going on. I spoke to them about how it is imperitive to prepare now. With the stock market almost blowing away in the wind, and banks crumbling we need to prepare now. In all honesty we should have been preparing a decade ago. When I spoke to both of them about it they got the similar look on their face. Not that they weren't listening to me, but it was as if I had told them that their pet had died. I realized that no one wants to hear this stuff beause it makes them think, and it is a bit depressing to think we might have to go through hard times. I am not sure how well they believe me, but they weren't calling me crazy. I think they believe I am worked up over nothing, and what I am hearing has been cooked up by the media (as a side note: I notice that one topic that someone of any political party can agree on is that the Media is evil). Hopefully they do make plans. I told them that at the very least they should get solar paneling so they can run their water pump for their well water. I will tend my smallish garden, I will Listen to today's podcast, get some insight from the Michael Savage radio talk show, check my batteries to make sure they are topped off, and pray tonight for peace and at the same time ask the lord to give me strength to do what I have to do.....so I can do what I want to do. I got my new commuter bike (pedal powered) for my new daily commute to school. I'm returning to college after a nine year hiatus. So I'm preparing for a better life in several ways. I'm decreasing my gas usage, I'm preventing additional wear on my car, I've invested in an alternate form of transportation, I'm now getting more daily exercise, I'm coupling my daily ride with public transportation (I believe the more people use something, the harder it is to take away), and I'm increasing my marketability in an increasingly competitive job market my finishing my bachelor's degree. Sometimes preparations are more than stockpiling ammo. Although I did that too last weekend! Congrats DrGonzo on returning to school, wise move. Today I spent no money!!!!! And even pulled my annual credit report to check it over. A friend gave me a cot and mattress for the deer camp for this winter. I walked about 5 miles. Towards the end due to wanting to just get home and rest I took off the headphones and started thinking about my GHB. Thanks to this changes are in order such as adding more food and water. I just realized it would take me much longer to walk home then I thought since it is one thing to gauge how far you can by how fast you can walk a mile compared to how much time it takes to walk several miles. Yippee, I just got in 20 rolls of Kerlix, payed 15 shipped. Tonight took the dog for a three mile run, came back and rode the bike 5 miles to the VA for work. Got another five gallon bucket from a friend to fill with canned food. Ordered gamma seal lids for food storage buckets last night. This morning after work I hit Wal Mart & bought more dry staples & salt (since I hadn't considered it). This afternoon I'll be picking up a couple more PMAGS for the AR's along with ammo to fill them. Tomorrow a trip to the lake to see a guy about food grade barrels for water storage & to store stockpiled dog food in. Ordered some more magazines for my AKs, going to pick up some firearm cleaning supplies for storage. May be picking up a 2nd shortwave radio today, as well as some more rice for stoage. I bought more food supplies and tried to get some more days to work overtime. Bought electrolyte packets. Bought some more silver yesterday. 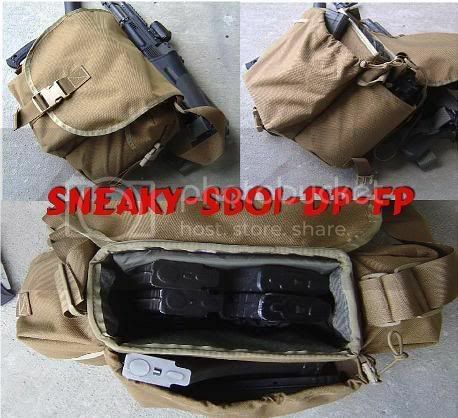 Bought some Molle pouches to complete my Civilian ammo sling bag (Maxpedition Manta with Molle pouches). That's a good looking rig, dude. a mag bag is a pretty good idea. I've been thinking about picking up one of the style that Gabe Suarez has at his website for my AKs. It's still got a civilian look to it so it's not so conspicuous. Ordered a Maxpedition Fatboy Versipack for an EDC bag. Been looking at bags for a while and finally decided on one! I have the Jumbo and it's nice. I keep a std 16oz water bottle in the bottle sling, but I really am thinking about a Collossus so I have more useable space. The Manta has the exact same frame as the Colossus, but with a blank molle front instead of a set of pouches. Repackaged 25 lbs of bread four into 6 cup vacuum sealed bags to make it easier to hide in more places. Will do rice, pancake mix, and sugar the same--but needed a break so I am doing this. Bought more rice and 12 lbs of salt.